How Does Vitamin C Keep Your Skin Looking Young? Vitamin C is known for containing powerful properties, with many people often praising it for alleviating the common cold. Consuming Vitamin C has a variety of health benefits, but applying Vitamin C to your face can yield plenty of anti-aging benefits to your skin. It creates a brighter complexion, evens out your skin tone, improves hydration and diminishes the appearance of fine lines and wrinkles. But how exactly does Vitamin C bring about all of these benefits? These benefits come from the ascorbic acid in Vitamin C, which creates younger, firmer looking skin. 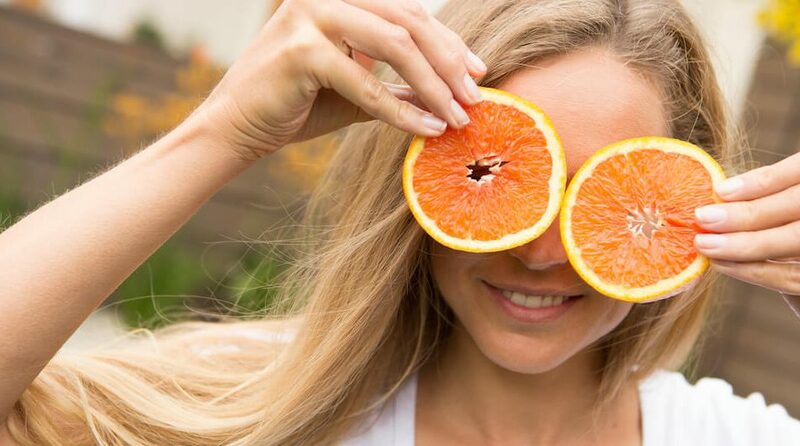 To learn how Vitamin C helps you maintain a youthful glow, it’s important to understand the effects that free radicals, the sun and collagen have on your skin. Free Radicals: So many of our skin care products protect against them, but what are they? Free radicals are unstable electrons in molecules that are caused by conditions in the environment and even food. They change the composition of healthy cells, and damage our skin cells, which can have visible effects such as wrinkles, sagging and roughness. Vitamin C contains antioxidants, which can interact with free radicals to terminate any vital damage to cells, and combat the effects of aging. Sun Damage: While we all enjoy soaking up the sun, it can have damaging effects on our skin if we don’t stay protected — and sometimes SPF just isn’t enough. Harmful UVA and UVB rays can eventually create wrinkles. 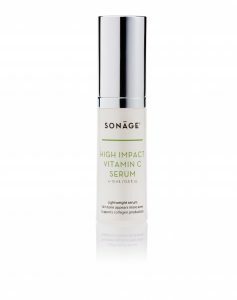 Our High Impact Vitamin C Serum strengthens your skin and repels things that can damage it. The powerful serum contains melanin-suppressing properties, which can prevent and fade brown spots caused by the sun. Collagen: Collagen is one of the most important components of keeping your skin looking young. Collagen is a connecting tissue that keeps your skin layers together. As you age, you lose collagen, which causes the skin to sink and create wrinkles. The decline of collagen also allows facial expressions and movements to leave marks on our faces. Vitamin C is known to give you younger and firmer skin because it increases and stimulates collagen production to avoid aging in your skin. Vitamin C is not stable and can cause adverse reactions or allergies. Wrong. Ascorbic Acid is Vitamin C in its purest form, and on its own does have the potential to be unstable. However, when it is blended with natural derivatives like magnesium and antioxidants, it delivers the anti-aging benefits we all seek. You need high concentrations of Vitamin C for it to work. Actually, anything above a 15% concentration can cause redness and irritation, which are symptoms we tend to avoid. While some Vitamin C products may irritate or even burn your skin. Our High Impact Vitamin C Serum has been formulated with a blend of ingredients — including fruit extracts from Mandarin and Grapefruit — and utilizes a unique liposomal encapsulated delivery system. The skin is the primary protective organ that allows very few foreign objects to penetrate. For this reason, some molecules are unable to effectively penetrate the stratum corneum; for example, actives such as collagen and elastin are too large to permeate efficiently. However, with the liposome as a vehicle we can release these active molecules through several layers of epidermis, but without diffusing too deeply. We are able to discharge hydrophilic and hydrophobic molecules in unison, and yet still manage the texture and efficacy of a topical application. Liposomes are spherical bubbles, which are essentially very small water droplets that release nutrients and ingredients slowly into the skin, delivering the maximum benefit without the irritation.